About 1844, Joseph Kaye, Huddersfield's master builder, constructed the larger of the two buildings now remaining on the site. An earlier mill had burnt down and the new building was designed to be fireproof, with stone floors and sliding metal doors leading to the staircases. The workers at the mill today still refer to the building as 'The Fireproof'. The smaller remaining building, 'The Warehouse', was built about 1828. By the 1930s, when this picture was taken, the Lumb's site covered the area indicated and was largely self-sufficient in gas and electricity. 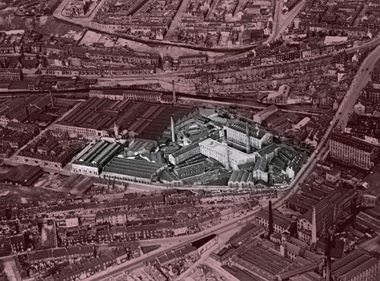 About the photograph: The extent of the Folly Hall Mill site in its prime can be seen in this aerial view, taken by Bradford photographer C. H. Wood in 1938. St. Thomas Road runs along the lower edge of the premises, Chapel Hill to the right. Image courtesy of Bradford Museums, Galleries & Heritage. Originally the floors of The Fireproof were rented out to a variety of traders, but by the early twentieth century it was taken over entirely by Joseph Lumb & Co. for worsted spinning. 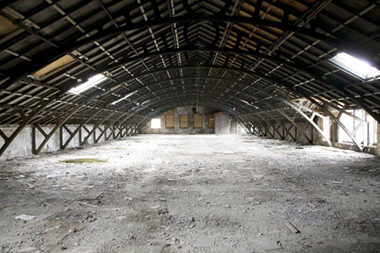 The astonishing cast iron roof structure is reminiscent of those in Victorian railway stations. In the latter days of Lumb's, the roof space was used for storage of all kinds of bric-a-brac. Joseph Lumb & Co built an international reputation for the quality of its worsted yarn. From 1870 onwards, the company imported high-quality Merino wool from Australia and South Africa. By doing so, Lumb's established an early international reputation for the silk-like quality of its worsted yarn. To encourage the sheep farmers to produce even better wool, in the middle of the twentieth century Teddie Lumb introduced the 'Golden Bale' medal, awarded each year to the farmer whose wool achieved the desired gossamer quality. The 'Golden Bale' is still an international standard for worsted. The Golden Bale Medal, awarded each year, is solid gold, designed and cast at the Royal Mint. Other than the quality of its product, Lumb's was outstanding for a strong mutual respect between workers and management that defies the stereotypical image of brutal mill management and abused workers. Undoubtedly, the work was very hard; in the first half of the twentieth century, the working day started at 6.30 a.m. and finished at 5.50 p.m.
Workers were fined one penny for being a minute late; fined two shillings and sixpence for being five minutes late, when the weekly wage was about thirty shillings. 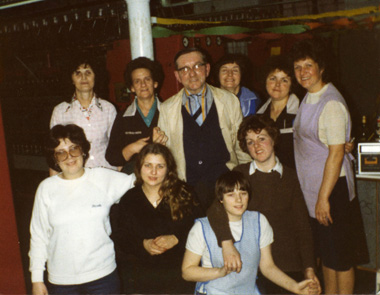 However, despite the long hours and hard work, almost everyone has reported on what a great place Lumb's was and the fun they had there, as part of the mill's extended family. This strong community cohesion was enhanced by a variety of social activities, which included talented sports teams playing in the local leagues. Following a severe decline in the British textile industry in the mid-1970s, Lumb's finally closed in 1980. ATC Dyers, an offshoot of Lumb's and a part of the Allied Textile consortium, remained on the site until 1987. The site was largely demolished in 1994. 'The Fireproof' has been designated a Grade II* listed building. JayTee Construction Ltd. began redevelopment work in 2008 on 'The Warehouse' and the 'The Fireproof' mill, which is due for completion in 2009. 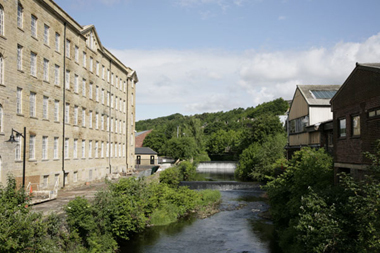 About the photograph: A popular viewpoint of the 'The Fireproof' mill, showing its proximity to the River Colne, from what used to be called "Engine Bridge". The same view appears at the beginning of the 1900 Mitchell & Kenyon footage that introduces the project's DVD. The north-east side of the building, shown here, faces the town centre.